Because it uses extra thick bread, it's important to make sure that the egg mixture is fully absorbed into the bread, otherwise, you'll just have dry bread at the center of the slices. Also, since it's so thick, the cooking is done in two steps: first we brown the french toast on the griddle, then finish the cooking in the oven to make sure it cooks all the way through. Beat eggs thoroughly. Whisk in sugar, half and half and vanilla. Pour the custard mixture into a shallow glass dish. It should be at least two inches deep to ensure the extra-thick bread can be fully submerged. Heat your griddle to medium-low, and melt the butter on it. Soak a couple of slices of bread (but only as many your griddle can accommodate at once) in the custard while you count to ten. Flip them over and repeat. Carefully remove the soaked slices from the custard, letting the excess liquid drain into the dish, and transfer the bread to the griddle. Flip when the bottoms are golden brown. When the other sides are also golden brown, remove from the griddle. 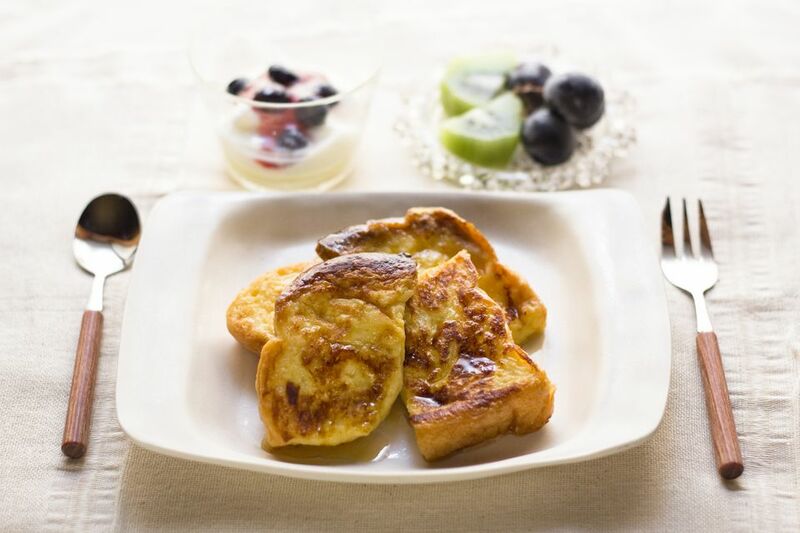 Transfer the browned French toast to the oven and cook for 8 to 10 minutes or until the custard at the center is fully cooked. Serve right away.